The Brighter Side YYC: Candy Bouquet ~ GREAT Gift Idea!! One of my favourite things is to accidentally run into a GREAT idea! It was mid afternoon, the day before Valentines day and I still hadn't bought a thing for my family. I know, I know! I'm always prepared. But this time I wasn't. I needed something for my boys, their caregiver AND my husband. But what?! Then, when working very hard... wink wink... a message popped up on my Facebook. It was a message from Candy Bouquet # 6775. 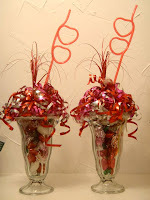 The message said "Open House for Candy Bouquets until 8pm - It's still not too late for Valentines Day". PERFECT! I'll stop in on my way home! 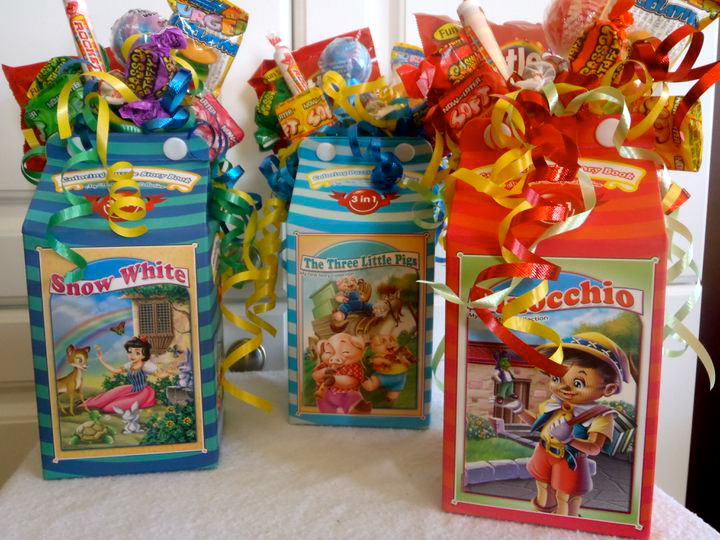 When I arrived it wasn't just a Candy Bouquet, it was a Candy Forest! 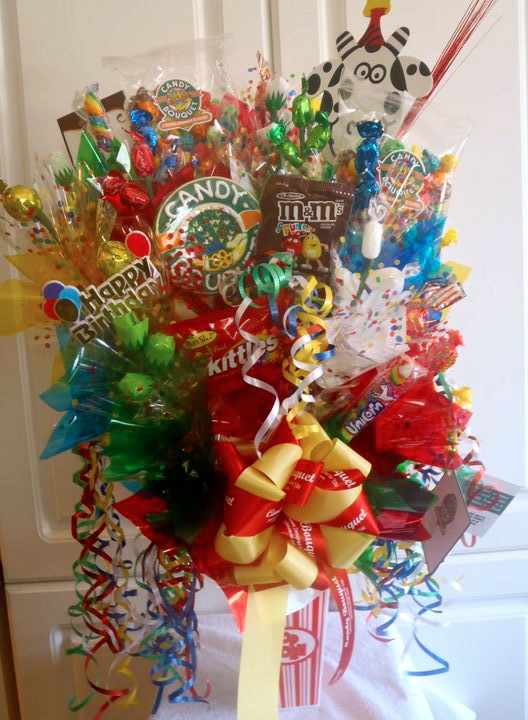 An explosion of AMAZING candy bouquets from Candy Bouquet #6775! (That's their franchise number). The pictures I was looking at on the internet did NOT do these creations justice! They were beautifully hand crafted with delicious candies. From chocolates, to candy rockets, to suckers. You name it, it was on it. Tricia Spruit, owner of Candy Bouquet hand makes every single one. What a GREAT, delicious alternative to flowers that will never fade, wilt or die. It's a unique, one-of-a-kind gift that will make a lasting impression... AND can be enjoyed for several months. I got this beautiful soda glass one for my children's caregiver. She LOVED it! And the ones in the milk box containers were for my boys. 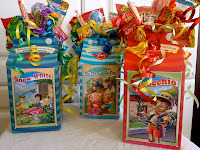 What I loved about those ones was that inside the box wasn't MORE candy, it was a puzzle and crayons! This way they had some candy on top, and a toy to keep them busy. The soda glass one was $18 and the puzzle boxes were $10. I didn't get a picture of my husbands AWESOME bouquet, but he said he loved it. It wasn't girly. It was outdoor themed. But if I knew she could custom make them... 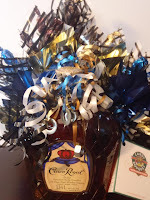 I may have picked the one with the Crown Royal for him instead! Delivery services are available in Calgary for just $10! And if it's a last minute idea, like a gift at the hospital, Candy Bouquet has a selection of bouquets ready to go when you need it. And remember, these arrangements do not contain any latex, and they are great for allergy sufferers in the hospital. And I'm told the nurses LOVE it when patients share their sweet treats! 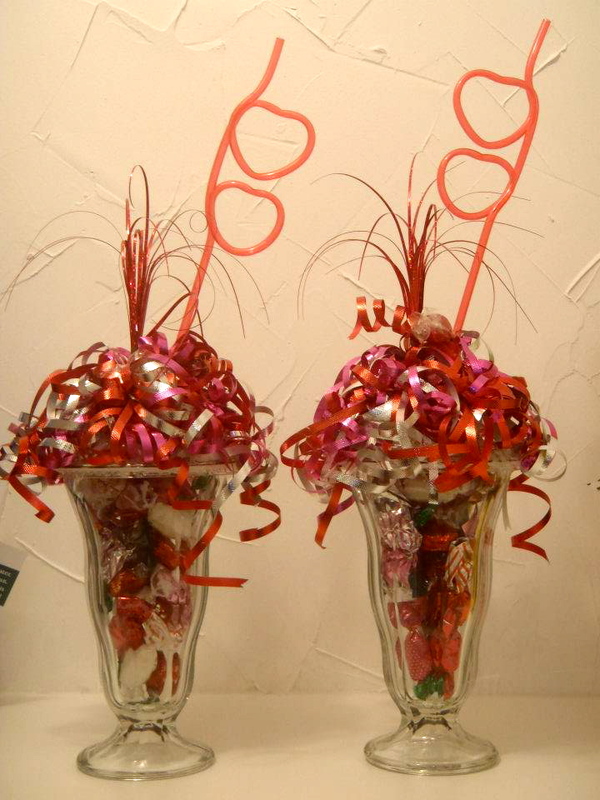 So, as I browsed through Tricia's amazing creations, I asked her what her goals were and why Candy Bouquets? ... Because every business has a story. Their candy adventure started out as an opportunity for Tricia to help put a smile on someones face with a Candy Bouquet. She knew that her own smiles were tough to come by as her and her husband were going through a difficult year. Their beautiful baby boy was born with a complex form of spina bifida. And in order to provide him, along with their other 2 children, the best possible life, they needed to make some changes to accommodate the several ongoing medical appointments. As Tricia had a strong background in management and creativity, Candy Bouquet seemed to be a perfect fit for their life. For this family, being able to create these beautiful bouquets and make people smile was a blessing. In the long run, they hope to have a successful company, enough so they can expand and employ a mom facing the same restrictions as they did. How wonderful would that be to pay it forward. With that note of paying it forward, Candy Bouquet (#6775), also has a strong passion in helping out with charities and providing donations to the Children's Hospital on a regular basis. In particular, the Neuroscience Unit is very near and dear to their hearts (understandably). For more, find Candy Bouquet (#6775) on Facebook!